The first breads probably originate from Neolithic times, some 12,000 years ago. This was a very primitive bread probably made from stone crushed grain mixed with water and cooked on hot stones and covered with hot ashes. The Egyptians probably discovered around 4,000 BC that wheat dough ferments (think sourdough), thus forming gases, producing a lighter more pleasant eating and tasting loaf. The Banana originated in South-east Asia (probably on the Malaysian archipelago) and spread from India, to the Philippines, New Guinea, etc. It was cultivated by about 2,000 BC, but these people were rice eaters, and wheat was unknown there, so breads were not part of their culture. Theophrastus (a Greek naturalist philosopher) around the Fourth century BC, in what is probably the first scientific book on botany, describes the banana plant. We know that the Greeks made bread with honey, spices and fruits around the time of Pliny (23 to 79 AD), and we also know that Pliny had knowledge of the banana (he also described them in 77 AD). So could the Greeks have made any banana bread? A possibility, they made bread and had bananas. But flat breads (non-leavened) were made throughout the Middle East as early as 7,000 BC - but did they have bananas? Probably not until much later. But banana bread recipes for the most part are 'quick breads' . . . that is leavened with baking powder. Quick breads (chemically leavened) which most banana bread recipes are, were not developed until the end of the Eighteenth century. This took place in America, where pearlash was discovered. Pearlash is a refined form of potash, and it produces carbon dioxide gas in dough. In 'American Cookery' (1796) which was the first American cook book, Amelia Simmons published recipes using pearlash. Around this time America was also recorded as exporting around 8,000 tons of pearlash to Europe. But Amelia Simmons has no specific recipe for banana bread. Baking powder was not developed commercially until 1857 (phosphate baking powder). So the banana bread as we know it (a quick bread) could have been first made in America in the Eighteenth century when housewives discovered pearlash as a chemical leavening agent. 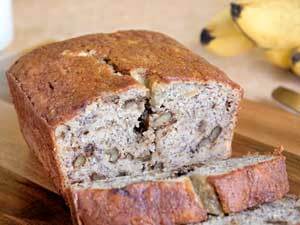 Fancy making one for yourself then try our Banana Bread recipe . . . with Walnuts. If you want to contact James just email him by clicking here.